A candle making jar is a relatively easy project . This was the first kind of candle I ever made, and I still like to make jar candles because they are so simple, self-contained and cute in a homey way. Traditionally, a Mason jar or similar glass container would be used to make a jar candle. There are many options available however, in your local craft store and even in your house. My first "jar" candle used a fishbowl-shaped vase filled with chunks of light green honeydew scented wax covered with clear wax. The floral department of your local craft store will provide many potential candle holders, including "bubble balls," cylinders, square vases, even little votive candle holder sized pieces. You can also buy jars made especially for candle making from specialty candle stores. 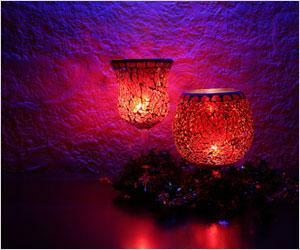 The main thing to keep in mind when choosing a candle making jar is to make sure that it is made of strong glass. If you can find a candle jar that is made of tempered glass, so much the better. Candle making jars must be able to withstand the heat of a candle burning inside them without cracking. That's why canning jars are such a popular choice; they are designed to go into boiling water! Once you have a receptacle for your candle, you will need a wick and some wax. If you buy a candle making jar from a candle company, the store should have a recommendation for the kind of wick to use. For example, the jar above calls for 44-20-18 cotton-core "S" wick. If you aren't sure what kind of wax to buy to use with your candle making jar, measure the width of the mouth of your container. Then check the recommendations on the wicks at your craft store. S wick, for instance, is ideal for candles two to three inches in diameter. The size of wick matters in container candle making because you want to use a wick that is thick enough that it will allow all of the wax to melt down as the candle burns, so that when the wick is gone there will be no wax (or very little) left in your container. At the same time, you don't want to use a wick that is so large that the candle burns very quickly. If your store does not have a good selection of wicks, buy the general purpose wick. You might have a little extra wax in the jar or an uneven burn, but it's not the end of the world. You can always get the excess wax out when your wick is gone by putting the container in a pot of heated water and allowing the wax to melt. If you want a colored or scented candle, you'll also need candle colorant and scent. You'll also need a wick tab to hold the wick in place at the bottom center of your container, and a double-boiler to melt your wax. Making a jar candle is very simple. Position your wick on the wick tab in the center of the container. Make sure that the wick is straight through the container. You might want to wrap the end of the wick around a skewer that sits on top of the container and secure that end of the wick to the side of the container with a little mold sealer. If you use pre-made wax chunks like I did, they will help hold the wick straight. Once the container is prepared, melt your wax. Add any color and scent when the wax is almost through melting. Wait a minute or so after the wax is melted and all the color and fragrance combined before pouring the wax into the container. Make sure your container is on a stable surface protected from hot wax before pouring. Like filling a Mason jar for canning, you want to leave an inch or two "head space" at the top of the jar. Leave a little melted wax to fill in the candle after it cools. Allow the candle to cool. Remelt your saved wax and pour into the crevices formed in the top of the candle. Try not to pour wax above the original top of the candle. Container candles are great in every room of the house. They make a fun, quick, inexpensive gift for a housewarming or hostess gift. You can make citronella candles and set them around your patio in the summer to keep bugs away. Because they're made in jars, they are heavy enough to stand up to a little wind. Using a container is a great way to learn the basics of candle making without having to invest in a bunch of molds. You can still have a lot of fun, though, and make many different kinds of candles as you learn.